Working at Scuderia certainly has it perks. Aside from the fun working environment, cool customers and fantastic coworkers, I learn something new every day that I work there. I really do! There's so much out there that you just don't know what you'll find until you start digging around putting customers in various pants, jackets or gloves. It can be a lot of work, trying on every pair of pants in the store, every pair of gloves, every jacket or every helmet that could possibly fit you. But it's worth it in the long run, as you'll have something that properly fits, protects and works for you. 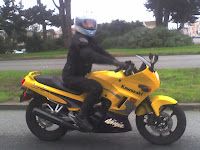 Buying gear is similar to buying regular clothes, however, there's one big difference in shopping, yes, your motorcycle! 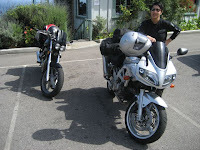 I made a huge Scuderia faux pas when I safely assumed that my friend had tried on her overpants while seated on a bike. (Sorry Aleks!) I was running around helping someone else at the same time and when I finished to check on her, she said she was good to go with the REV'IT Zip Pants. I normally tell everyone to try the gear on their bike or on one of our bikes. Fit is really THAT important, and can change drastically from standing in front of a mirror to sitting on a Triumph Speed Triple, Aprilia Shiver, RSV4 or a Victory. Unfortunately, she found out the hard way when going for a ride last weekend that those pants are too short in riding position. That's why shopping at Scuderia is such a different experience. We actually care about what you're wearing while riding, how it fits and whether or not it's the right garment for you. We will give you (as much advice as you'll let us, sometimes even more!) in order to help you make the right decisions, but nine times out of ten, customers will return and buy what we end up recommending, simply because they can't find that kind of service, knowledge and experience at other apparel shops. That's why you'll find manufacturers such as REV'IT, Dainese, and RS Taichi hanging in the store. Most people have never heard of these brands, and that's because they're what we call "Real Gear". They protect and serve multiple functions while riding. Many times I get the question: "Why does this jacket cost $500 while this one costs $150?". Well that answer depends a lot on whether it's textile or leather, where it's made, what the intended purpose is, what it's made of and a plethora of other details. High end brands as the ones mentioned above have spent thousands of dollars into actual research in designing gear. There is no 'cut and paste' for these brands. They actually are designing gear to protect riders, while being light, comfortable, warm and/or cool. They're venturing out into other apparel industries such as camping, hiking and snowboarding to see what can be adapted for motorcyclists. You'll find innovative, highly technical materials and features on the garments that you aren't used to seeing on motorcycle gear such as Gore-Tex, Super-Fabric, Schoeller®, NanoSphere and SAS-TEC. Why shouldn't we have every piece of technology available to them to protect us while riding? It only makes sense. I think the idea of using 21st century technology to protect riders is a foreign one to many shoppers. So many companies including REV'IT and Dainese are using what's out there to make their garments better, more protective and as functional as possible. I sat down recently with Brian Finnerty, the Pacific Northwest representative for REV'IT and he gave me some really great insight into how REV'IT is different from other manufacturers out there. The company started in 1995 in European markets, establishing themselves before entering into the US market in 2004. Since then, their market share as grown ~30% every year since being in the US. I think people find it hard to make the connection between "motorcycling" "safety" and "technology". Look around you, what have you spent more money on because it's better, the quality is outstanding, the craftsmanship is amazing, the technology is beyond 21st century, and probably took several years to create? In a sport as risky and intense as motorcycling, why do some people think it's less important to spend money to protect themselves? I think that's what makes the partnership between Scuderia and REV'IT so unique. They both prioritize and value the same things when it comes to helping find people the right gear: Safety, Protection: Is there sufficient armor everywhere? Fitment: Does everything fit properly? How to assess proper fit? REV'IT doesn't choose to go the traditional distributor route. You'll find that many manufacturers who go this route are very focused on the quality of the products, as they aren't going to sell themselves in a catalog or on a shelf. They actually have to train and show their dealers how to properly sell the gear to their customer base, as well as educate them on the value of high end gear vs. low end gear. When dealers themselves aren't equipped or qualified to sell gear, it says a lot about the kind of shopping experience customers are going to have. The volume of technology and research that goes into these garments is absolutely amazing. As is the buying experience. When you walk into most shops, you'll see something on a hangar and ask someone what colors they come in and if they have your size. End of story. But that's not the end of the story with apparel staff that aren't motivated by commissions, but by customer satisfaction. Nothing makes me happier than when a customer tries on the perfect fitting jacket for the first time and notices the real differences between that and others he/she has tried before. The sealed zippers, tapered sleeves, extra buttons in the right place, armor that sits comfortably over the shoulder, the difference in comfort in riding position, they all work together to make that fit perfect for someone. Believe it or not, this is hugely important for REV'IT. Only when proper fitment is achieved can the garments be truly appreciated. The next time you decide to shop for gear, see if the apparel people know how to fit you, make sure they're asking you the right questions. Frankly, no matter how much research you do on your own, you won't find ANY website (except mine, of course) that's going to tell you HOW to shop for your gear and make sure it fits. Tell them what you're looking for in your jacket, gloves, pants, etc. Tell them what you need out of your gear, tell them what you ride, tell them everything. If you don't they may not be making the right recommendation for you. And if they're not telling you to sit on the bike or assume riding position while trying it on, then they Definitely aren't fitting you right.